It’s no secret that no matter how many haircare brands I try, I always resort back to my trusty Redken Color Extend lineup. That being said, it doesn’t mean I don’t like to give new haircare brands a try and learn about the latest innovations on the market today. 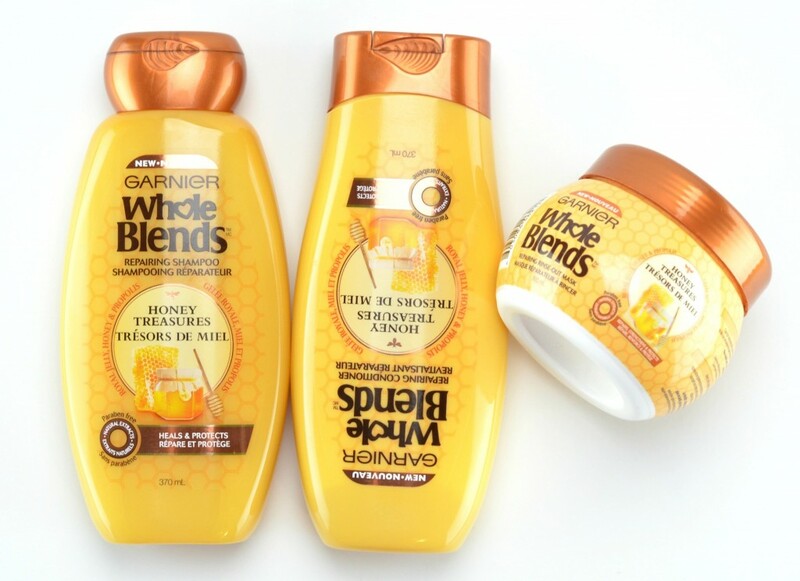 Although the Garnier Whole Blends collection was developed way back in 2010, it didn’t hit the Canadian market until the beginning of this year. 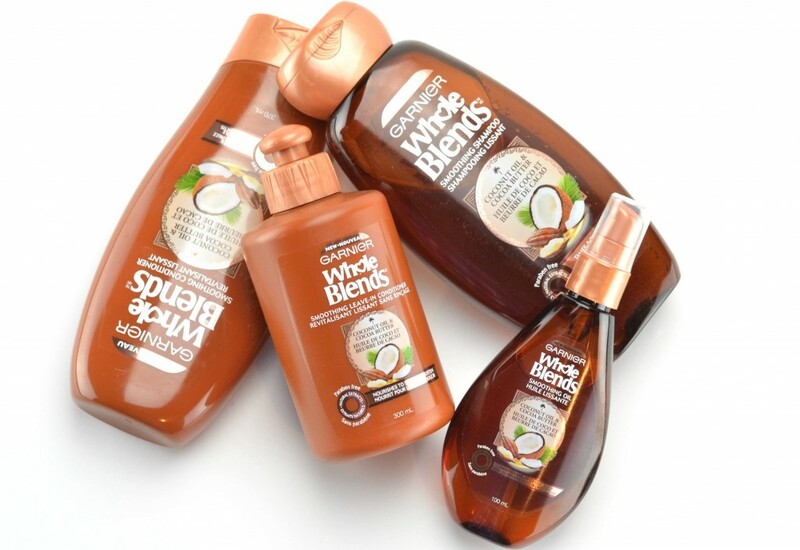 The entire lineup (Coconut Water & Vanilla, Avocado Oil & Shea Butter, Coconut Oil & Cocoa Butter, Cranberry and Honey blends, Honey Treasures and Green Apple & Green Tea) was created with professional salon formulas, without any parabens, yet comes with a price point that everyone can afford. 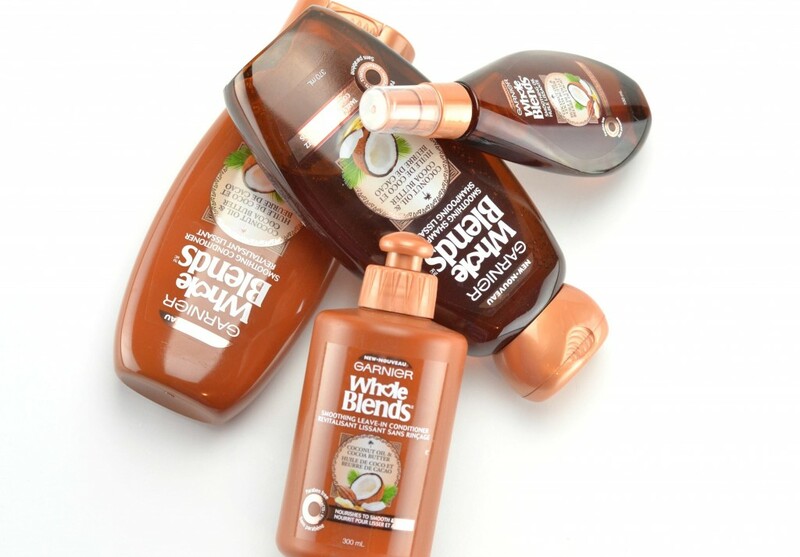 Instead of relying on heavy silicones and waxes, typically found in drugstore brands that help to add moisture back into your hair, the Garnier Whole Blends Collections actually use natural and antioxidant ingredients, like coconut water, vanilla milk, argan oil, coconut oil, cocoa butter, avocado oil and shea butter to help keep your hair healthy, shiny and moisturized. There’s a total of 6 Whole Blends formulas to choose from, so whether you have over-processed, dry scalp or dry, damaged hair, or looking to tame and control frizz, heal and protect strands or quench and soften your main, there’s a formula designed and created for you. 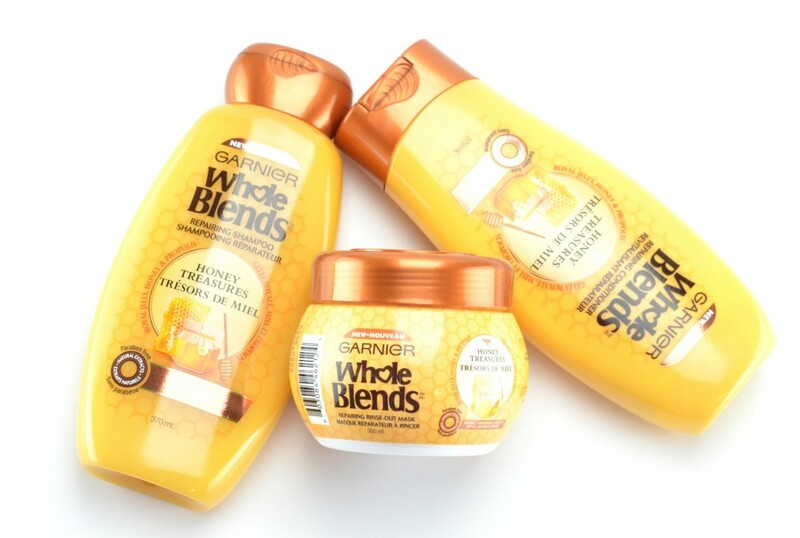 I’ve been testing out both the Garnier Whole Blends Smoothing and Repairing Shampoo and Conditioners for the past few weeks, and although I can’t necessarily tell the difference between the two formulas, I can say that both recipes have helped me restore my hair back to its healthy and natural state. Each has its own signature natural scent that’s uniquely fragranced without being too strong or overwhelming. The Smoothing collection is formulated with coconut oil and cocoa butter and smells incredibly tropical, whereas the Repairing collection is created with honey and has a very sweet and fruity aroma. Each bottle is made with recyclable plastic, reducing both waste and water consumption to help ensure we keep less waste out of our landfills. 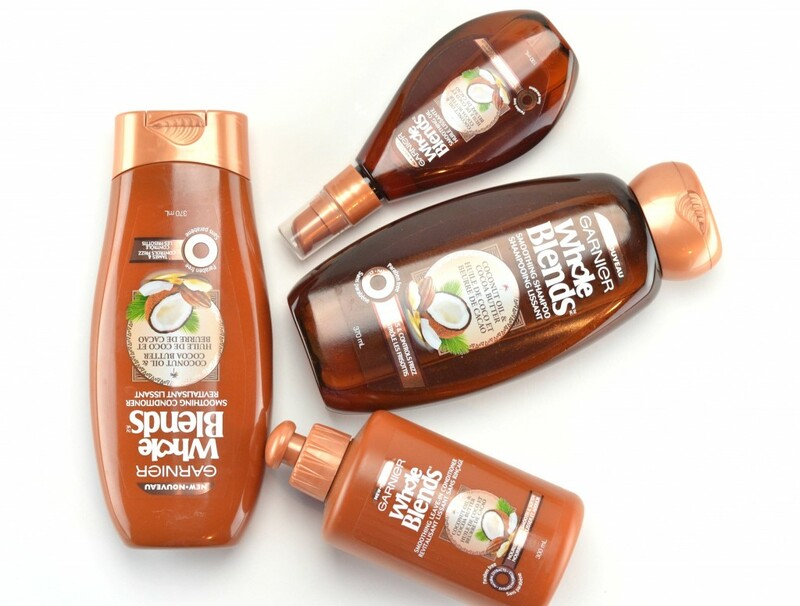 Each has a rich and creamy consistency that does an amazing job at cleansing my hair of all dirt, oil and product buildup, yet is gentle enough for daily use. Both seem to instantly add moisture back into my chemically-treated hair, nourishing it from the inside out. Although it comes to a decent lather, it doesn’t seem to strip my hair of its natural oils. 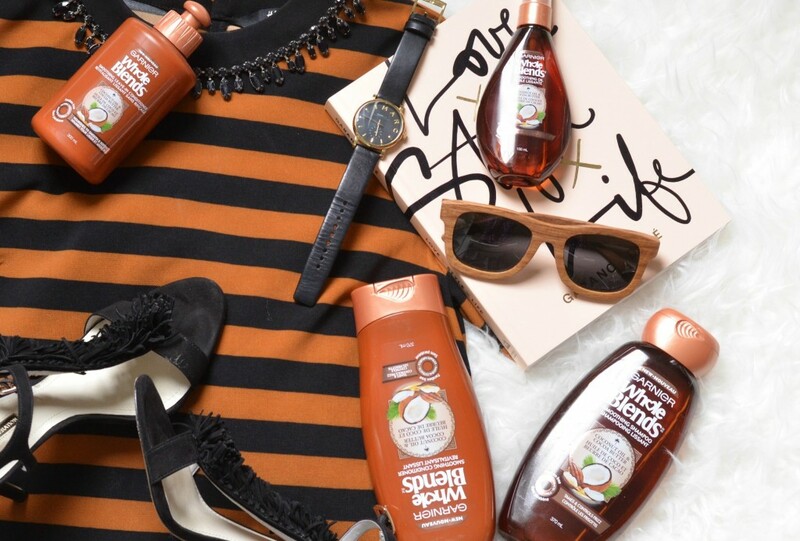 The combination of shampoo and conditioner helps to control frizz and fly-a-ways, while leaving my strands feeling slightly stronger and with less breakage and split ends. 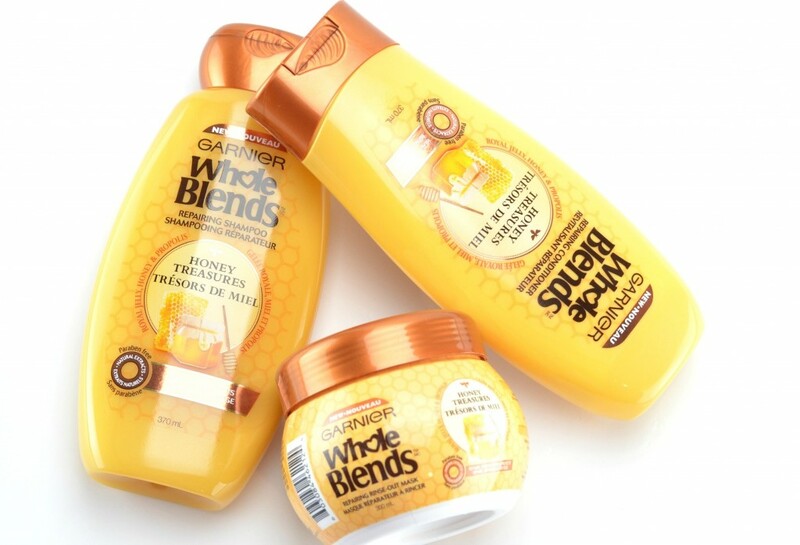 If you’re looking for a new affordable haircare system, I highly suggest taking a look at the new Garnier Whole Blends Collections. Its lightweight formula cleanses, adds moisture and provides an incredibly shiny finish (without looking greasy) all with an intoxicating, delicious scent. Achieve salon quality results, without breaking the bank. 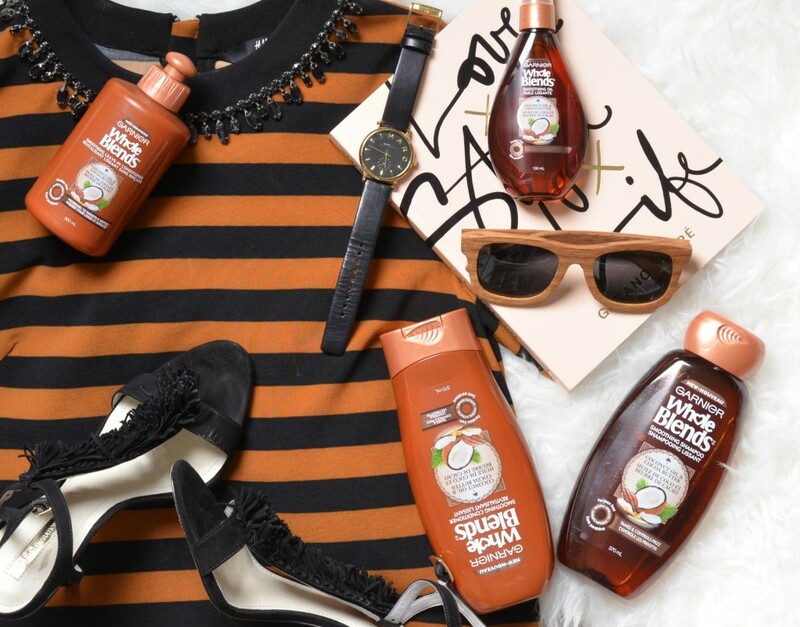 Shampoo and Conditioners retail for $6 for 370ml. Looking to take your hair to an entirely different level, all 6 lineups come with leave-in conditioners, hair masks and oils to deeply nourishe, hydrate and moisturize for soft, smooth, frizz-free hair.